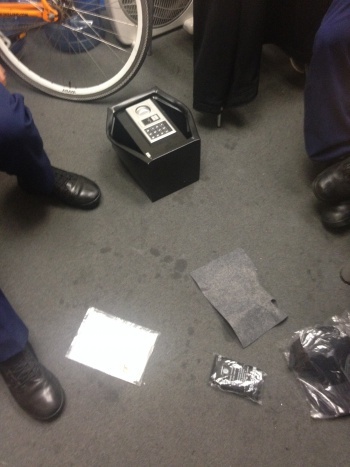 Ubisoft sent a beeping, black safe to the Sydney, Australia offices of a major online publication. Ninemsn, a major Australian online publication, alerted authorities yesterday after receiving a beeping, black safe and a note. The reporters had no indication that this safe contained promotional material for Ubisoft's Watch Dogs. The letter instructed the recipient to "check your voicemail," but the reporter had no voicemail. Reporters tried to open the safe with a pin code that was attached to the safe. When they were unsuccessful, the safe began to beep. Employees were sent home and a bomb squad was called in to investigate. Inside the safe they found a copy of Watch Dogs, a baseball cap, a beanie, and a note stating the game's embargo was for 5 p.m.
Ubisoft Australia had sent voicemails and packages as themed PR for Watch Dogs. "Our team in Australia sent voicemail messages to some local media alerting them that they'd receive a special package to the game," Ubisoft said in a statement. "Unfortunately, the delivery to Ninemsn didn't go as planned, and we unreservedly apologize to Ninemsn's staff for the mistake and for any problems caused as a result. We will take additional precautions in the future to ensure this kind of situation doesn't happen again." Ninemsn editor Hal Crawford said employees had first checked in with other newsrooms to see if they had received a similar package as they assumed the package was "a PR stunt." The reporters were never panicked but chose to take precautions because they had no idea what the safe held. "This is definitely the other side of the line in terms of what is safe for a PR company to send anonymously to a newsroom," Crawford said. "The thing was black, heavy, and slightly creepy."